One of the things that Deer Creek Structures strives to do is provide our valued customers with as many options as possible. We want your customized barn to fit all of your needs, and match the style that you desire. Plus, and perhaps most importantly, we want to ensure that your horse or horses are as comfortable as possible in their living quarters. After consulting with our customers to formulate a “blueprint” of what they want their barn to be, we go over a myriad of different foundation and style options. For openers, our customers can choose whether they want a shingle roof that is guaranteed to last at least 30 years, or a roof with metal insulation. Next, barn owners can choose what type of kickboard, roof deck overhangs and tacks they want. Additionally, customers can choose from a plethora of different supplemental doors, including, a Dutch door, a service door and a sliding door with different sized grill fronts. Extra windows and vents are also an option, as are a range of overhangs. Owners can also choose to have us install metal gates. 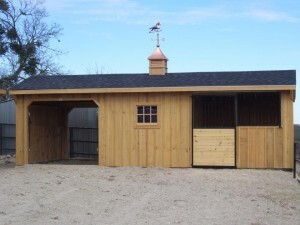 There are also several appealing options for the exterior of your barn. Shingle colors include a rustic cedar, a natural timber and a weather wood look. Also available are a rustic slate, a rustic black and a rustic hickory style, as well as an Old English Pewter, an Oxford grey and a hunter green color. Other cool options that we offer includes cupola, which is copper topping, as well as seal and stain services. However, please don’t feel relegated to just these options. Customer satisfaction is our number goal, and if you can dream it, we can build it! For more information on our portable barn options, please click here.